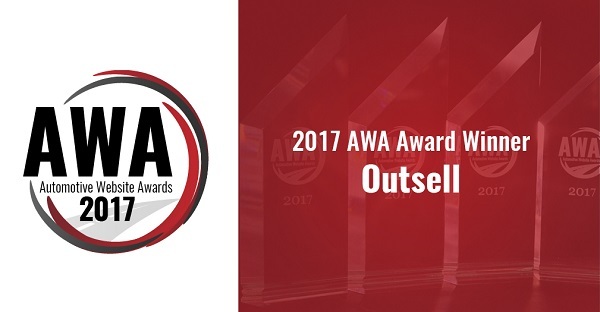 Outsell announced today that its multi-channel marketing platform won the 2017 Automotive Website Award (AWA) in the Marketing Solutions category. The Automotive Website Awards, created by PCG Companies, took place at the National Automotive Dealers Association (NADA) Convention on January 27, 2017. The award show presented 37 awards to the best website and technology products on the market for car dealers. For more information about the winners of the 2017 AWAs, please visit http://www.awa.autos. Outsell is a multi-channel marketing automation platform that manages millions of interactions every month for dealers representing all major automotive brands. It incorporates the industry’s first machine-learning based predictive analytics solution for dealerships that automatically harnesses data to better identify, connect with, and market smarter to a dealer’s entire customer database. Outsell gives dealers the flexibility to customize communications that reflect and align with their brand’s marketing initiatives, and as a result, dealers are experiencing impressive returns of 9x to 30x on their Outsell investment.